A scholarship is a kind of a financial aid or assistance that is provided to a person mostly a student to pursue his educational endeavors in various fields. A scholarship is an award to the deserving students who meet certain criteria or standard that is set by the donor organization. This criteria or standard is mostly reflective of the cause and theme of the donor of the scholarship. Scholarship money is a type of a financial assistance or help that does not need to be repaid by the receiver. What is scholarship application form? Any person or student that wishes or desires to avail a scholarship opportunity must file a request in a formal way. The first step towards this process is filling in of the scholarship application form. This is a pre-written application from the prospective candidate and helps the donor extract the needed information from the applicant. By obtaining the required information and data from the desired applicant, it becomes easier for the donor to analyze and critically evaluate the entitlement of the individual. It is important to check whether the candidate falls within the given criteria or not. Only then the selected person is awarded the scholarship. Most of the donor organizations display the scholarship programs on their notice boards or websites. These come with specific information and details about the amount, its eligibility, time period and other terms and conditions. 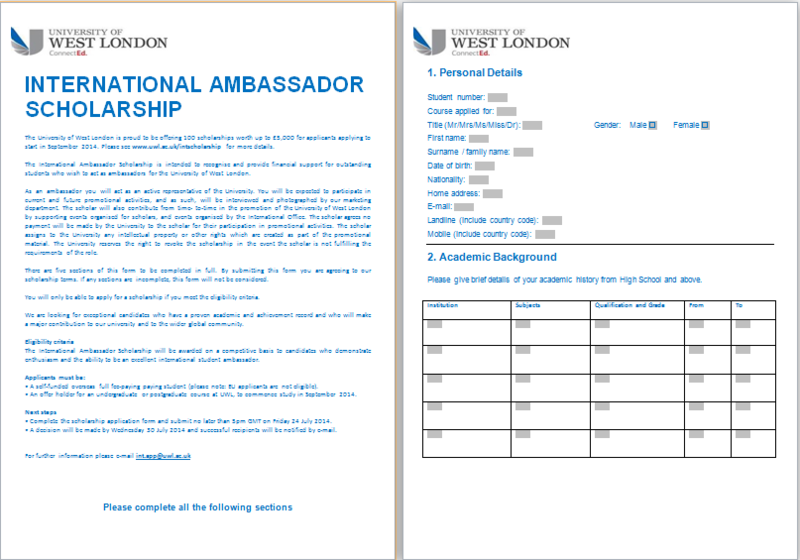 The scholarship application form is also provided on the website or can be easily obtained from the concerned authority or designated official.